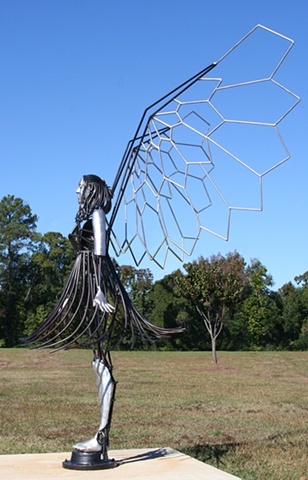 I came up with the concept for the Guardian Angel for the New Bern Airport Outdoor Sculpture Exhibition. I decided on the concept of a guardian angel that exists in the real world through the real friends and family that love and watch out for an individual. I took the molds for the cast aluminum pieces from people that have been there for me at a coincidental time in my life. The pieces represent the ways an angel can truly exist. The steel rod method that I have developed worked well for this concept because it gives the Angel an ethereal feeling.